This was the ninth night of twelve at the Intakt Festival. The first half presented a London debut as leader for Stefan Aeby, He has already popped up twice in the festival as a loyal member of bands led by Sarah Buechi and Christoph Irniger, but here the attentive Vortex audience was able to hear him on his own terms. 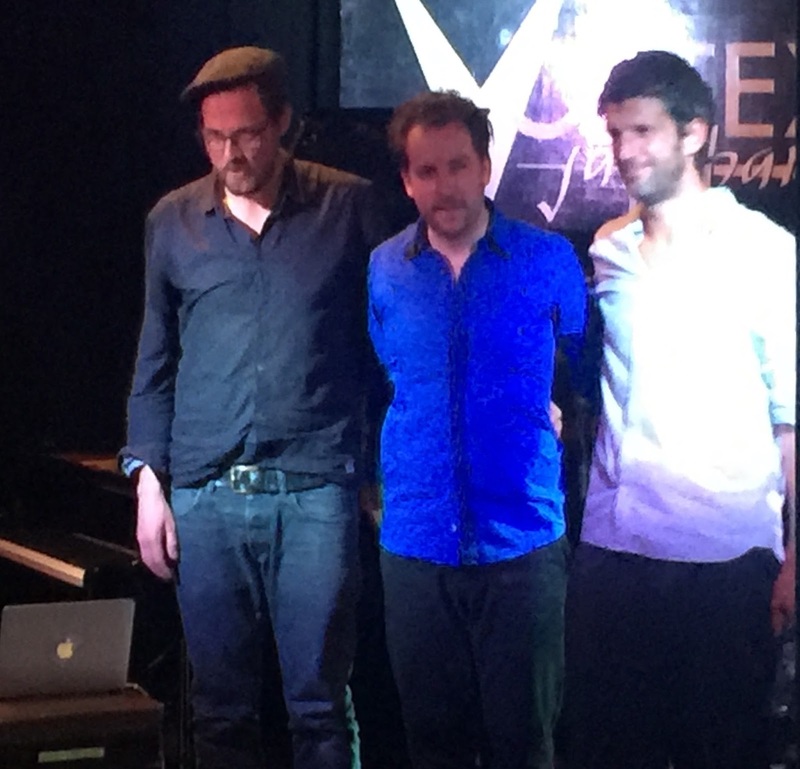 Aeby brings in processed sounds with the piano, he allows bassist Andre Pousaz (impeccable tuning) and drummer Michi Stulz (great sense of colour) to keep him anchored, but Aeby's real self-discipline is in never letting go of a melodic thread. I was reminded in the earlier part of the set by great and unflashy and unfailingly melodic Italian pianists like Rita Marcotulli or Giovanni Mirabassi. Yes, things were to got rockier and more electronic, but the sense of line and balance always remained. It was a very well shaped set indeed. One might construct a theory - that Swiss artists will always know where the peaks are (like Paul Klee or Hodler drawing the Niesen). Whatever. Aeby's intensity builds were incredibly well judged, with all three trio members feeling them remarkably in synch and in balance, but rather than going out in a blaze of glory, this trio has a way of enjoying the view once they get to the top. the climaxes were followed by long, measured, thoughtful exhales. Control, purpose, collegiality, respect, deep sense of civilisation. We might be describing the spirit of the Intakt Festival. But all of those were encapsulated in Aeby's end-of-set acknowledgements: before he got round to thanking his trio colleagues he made a point of singling out Ally who does the Vortex's sound. Green Dolphin Street and quirky originals from Aki or Rudi, often with similarly quirky titles in German which Rudi struggled to explain in English. Most striking was the way they added in a lot of humour, both in the music and in the whole presentation of the set. It thus combined tremendous playing from both performers with a lot of fun.